Panettone is a sweetened bread from the Milan area that Italians enjoy throughout the holidays. Containing candied citrus and raisins/sultanas, a piece of panettone served with un caffè makes a great afternoon snack. Later, a slice of panettone with a glass of prosecco – or limoncello – is the perfect ending to any meal during this festive season. That’s not the only way to serve this tasty bread, however. Over the years, I’ve used day-old panettone to make bread pudding and pain perdu (aka French toast, aka eggy bread). In fact, very often I’ll buy a couple of the loaves and place them directly into the freezer. Weeks later, I’ll retrieve one and treat myself to pain perdu on one morning, with some bread pudding on the next. I’m not much of a breakfast person but I really do enjoy “Panettone Week”. What’s not to love? Anyway, since I so often prepare the dishes back-to-back, and the pain perdu recipe is really quite simple, I’m going to share both in one post. I’ll start with Panettone Pain Perdu — for no other reason than I’m a sucker for recipes with an alliterative title. This recipe is pretty straight forward. I would caution you, however, from just slicing a panettone and diving in. Always cut and taste a slice before using it as the base for another recipe. First off, it’s delicious, so, why not? Secondly, not all panettone are created equal. Best to learn what flavors you’re dealing with before adding seasonings of any kind. We’ve all made variations of this dish, so, there’s really no need to give it the “full recipe treatment.” This dish is very much dependent upon your own taste. Pre-heat your oven to 200˚ F (95˚ C). First off, get your egg mixture together. I usually plan 1 large egg per slice of panettone. To that, I’ll add a couple of tablespoons of sour cream or Greek yogurt or cream or milk. Too complicated? Grab that container of left-over eggnog and use it in place of some or all the egg mixture just described. Next, spice it up a bit. I like to grate a little nutmeg into the eggs/nog but have been known to add a little cinnamon, as well. Just be sure to taste the eggnog before adding any more spices. Depending upon how sweet your panettone is, you may want to add a little sugar to the mix, too. Now, give it a good whisk and set aside. Place equal amounts of sliced strawberries – I’ve also used blueberries but any berry will do – and maple syrup in a small pan and heat over a medium heat. Once it begins to boil, reduce heat to a soft simmer and cook for about 5 minutes before turning the heat to very low to keep warm. Now, for the panettone. You want thick slices, at least an inch-and-a-half (4 cm) thick. Panettone is filled with bits of candied fruit and they may cause thinner slices to fall apart during or after soaking. While you heat the griddle, frying or cast iron pan, or whatever cooking surface you intend to use, dip each piece of panettone into the eggs/nog. Be sure to evenly coat each side of every slice. Melt a bit of butter on the cooking surface and reduce heat to medium before placing the now egg-soaked panettone into the pan. Cook until golden brown — about 5 to 8 minutes — before flipping to cook the other side. Cook for about 5 minutes more. Place on a platter and keep warm in the pre-heated oven while you cook the rest. Serve garnished with powdered sugar (optional) and accompanied by a gravy boat filled with the warmed berry-laden syrup. For a different take on Panettone Pain Perdu, check out the recipes presented by blogging buddies BAM, of Bam’s Kitchen, and/or David, of Cocoa and Lavender. If you can, take a few minutes to check out each of these 2 wonderful blogs — but eat before you do. You’re gonna be mighty hungry if you don’t. Admittedly, this dish is a little more involved to prepare but don’t let that stop you, Panettone makes a wonderful bread pudding and who doesn’t love to start the day with a bit arancello-flavored sauce? At least 30 minutes before you begin, combine the dried cranberries in a bowl with 1/2 cup of arancello. Once fully soaked and needed in the recipe, drain and be sure to reserve the excess arancello for use in the orange sauce – Step 15. Liberally butter a 9 X 13″ (23 X 33 cm) baking dish. 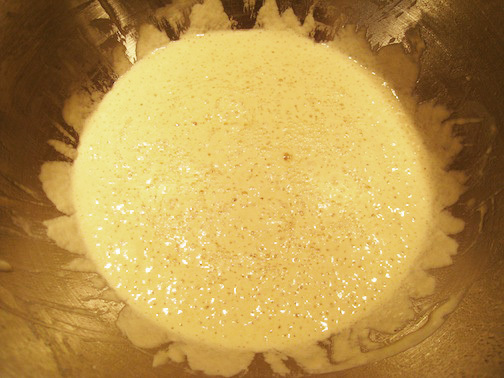 In a large mixing bowl, add 1 tbsp arancello, the eggs, and sugar. Whisk to dissolve the sugar. To the same bowl, add the heavy cream, half-and-half, salt, nutmeg, and orange zest. Mix until fully combined. Spread an even layer of the cubed panettone into the prepared banking dish. Drain the cranberries, reserving the liquid for use in the orange sauce. Sprinkle the cranberries over the top of the bread cubes in the baking dish. Give the custard mixture one last whisking before pouring it over the contents of the baking dish. Cover the dish with foil and refrigerate for at least a couple of hours or overnight. Once the dish has rested, pre-heat the oven to 350˚ F (175˚ C). Remove the foil cover and place the baking dish in an even larger pan on the oven’s center rack. Pour hot water into the larger pan until it reaches halfway up the side of the baking dish. Do not allow any water to get into the baking dish. Tent the larger pan with foil. Cut a few holes in the foil to vent any steam that may develop. After 30 minutes, remove the foil tent. Continue to bake the pudding until the custard is set and the top is browned — about 30 to 45 minutes. Pull from the oven, remove from the water bath, cover with foil, and allow to rest for 15 minutes. While the pudding rests, prepare the orange sauce. In a small sauce pan over medium heat, add the butter, sugar, arancello, orange juice, and salt. Stir and heat until the sugar is melted and the sauce fully heated. Once tempered, add the eggy mixture to the sauce, whisking all the while to prevent the egg becoming scrambled. Once fully incorporated, continue to whisk the sauce until it thickens — 2 to 3 minutes. Do not allow to boil. Bring the bread pudding to the table and drizzle a little of the orange sauce atop each serving. As mentioned earlier, no need to make a batch of arancello. Grand Marnier, an orange-flavored liqueur, may be substituted. For those with children or avoiding alcohol, substitute fresh orange juice for the liquor. Cooking times may vary depending upon the depth and overall size of the baking dish. If you liked today’s eggy dishes, how about another? Although we call it Eggs in Purgatory, Uova in Purgatorio, a number of nationalities have their own version and name for the dish. In its simplest form, eggs are cooked in tomato sauce and served. Sound easy? That’s because it is. You can read all about it when you click HERE. You may recall last Christmas I posted a baccalà recipe called Baccalà alla Marchigiana, in honor of Zia and her Mother-in-Law, Nonna. Shortly after it was posted, I began getting referrals from a website called Scoop.It. I followed the links back and within that website is another that highlights Le Marche, the district of Italy that Mom’s family, the Bartolini, came from. I was very surprised to see that our baccalà recipe was listed in a collection of Le Marche’s Christmas Eve dishes. Well, of course I subscribed and now I receive an email every week and depending upon the content, I may check out that week’s posts. Nothing unusual here, eh? 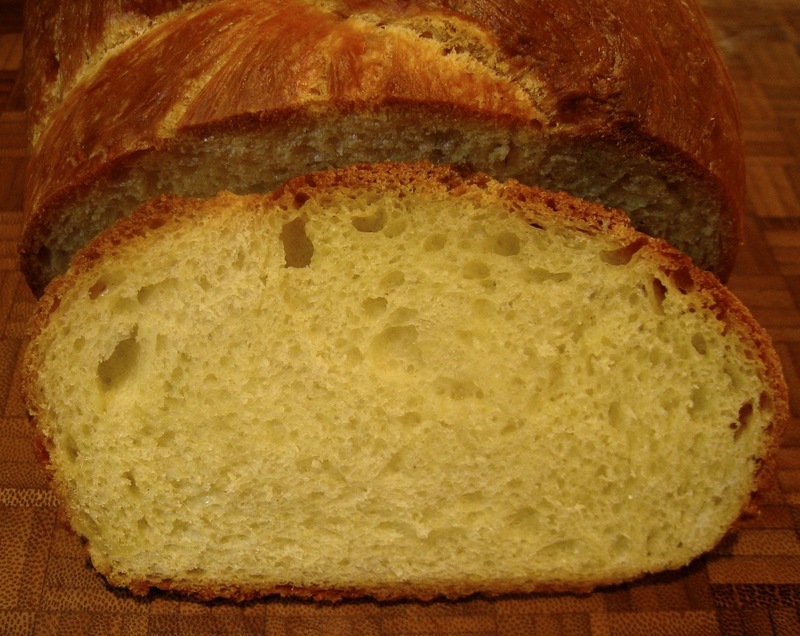 Last week, I received one such email and it featured the traditional Easter bread of Le Marche, Crescia al Formaggio. I’d never heard of this bread and just had to check it out. Shaped somewhat like a traditional Italian Christmas panettone, this bread is an egg bread that is loaded with cheese. Since this wasn’t a recipe of the site’s owner, Mariano Pallotinni, a link was provided to its origin. I took the link and, once there, I immediately checked out the recipe and liked what I saw. I was especially pleased to see that I already had all the ingredients needed, meaning there’d be no run to the store on a cold, rainy day. So, not wishing to lose the page, I went to the URL to bookmark it. That’s when I noticed the website responsible for this authentic Marchigiani Easter bread was none other than the King Arthur Flour Co. website!!! Once I got over the shock, I remembered that I’ve relied on the KAF website for other breads and the results were always good and, most importantly, consistent. Why not give this one a go? Well, I did and it’s been a while since I’ve enjoyed a new bread recipe as much as I enjoyed this one. Although the dough bears the characteristic yellow of an egg bread, there’s no mistaking that there’s cheese in the loaf, as your kitchen soon fills with the aroma of cheese bread baking in the oven. Nor is there anything shy about the flavor of cheese in the finished loaf but, if that’s not enough, there’s also a healthy bit of pepper added to give one’s palate a bit of a bite. 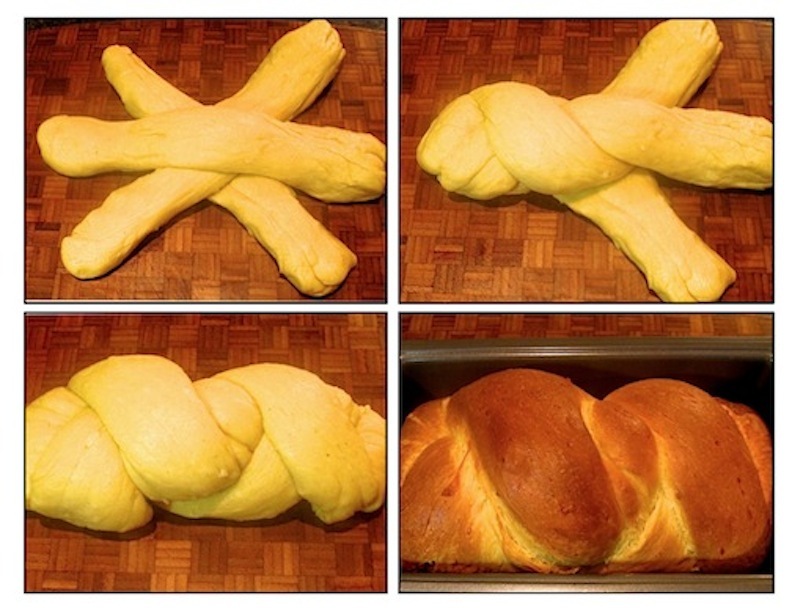 No doubt about it, this is a bread I’ll bake again and again, whether or not it’s Easter. Oh, yeah. There’s one more thing about this recipe that came as a surprise. Last Friday, I baked the loaf pictured within this post. On Sunday, I spoke with Zia and told her about the bread recipe I found via a Marchigiani website. As soon as I mentioned “Crescia al Formaggio,” Zia recalled the cheese bread that Grandma made at Easter when she and Mom were little girls. Of course, she couldn’t remember exact amounts but the 2 ingredient lists are pretty much the same, except that Grandma used Swiss cheese instead of the Asiago that I added. Considering she was baking this bread during the worst of the Great Depression, we both agreed that Grandma probably used whatever cheese she had on hand. So, for those keeping track, this KAF recipe has now been authenticated by 2 sources. although I honestly cannot believe the path it took to come back to my family’s kitchens. Before I send you to the websites, I want to clarify a couple of things. The recipe calls for 1¼ cups of cheese and suggests using Parmesan, Pecorino Romano, and/or Asiago cheeses. I combined equal parts of Pecorino and Asiago. Luckily, someone in the KAF Comments section asked for the amount of cheese needed by weight rather than volume. They responded that the required 1¼ cups of cheese equals a weight of 6 oz. With that, I followed the recipe exactly and, as I said, was very happy with the results. Wish I could say the same for my braiding skills. 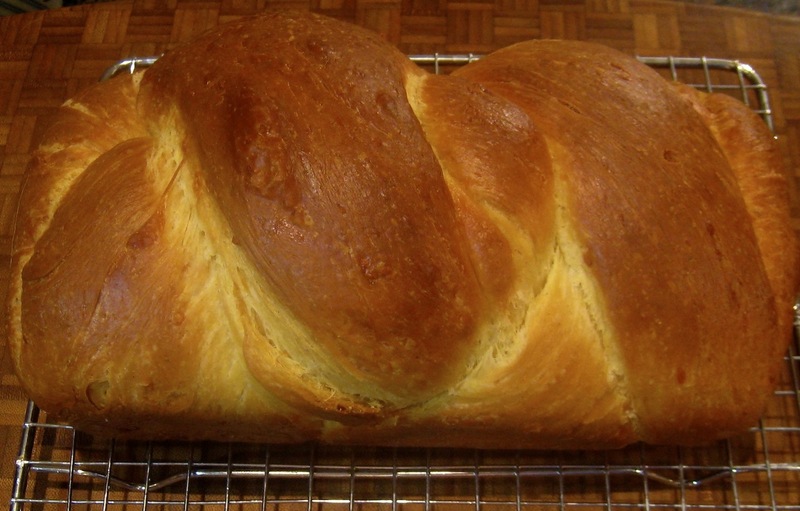 Having neither a panettone nor brioche pan, I followed the suggestion of braiding the dough. As you’ll see, my braid leaves much to be desired. Next time, I’ll follow Grandma’s lead and just make a round loaf. As I mentioned, I baked this bread on Friday and spoke with Zia about it on Sunday. Later that evening, as I was clearing out a spam folder, I came across a miss-sorted mailing from the King Arthur Flour Co. that highlighted 3 classic Easter breads. You guessed it. One of them was today’s Italian Easter cheese bread. This being the 4th of July weekend, I’m sure that there’ll be barbecues blazing from sea to shining sea. I’m equally sure that more than a few of them will be grilling up burgers and dogs for at least one meal during the long weekend. I know mine will. To that end, I’ve got a “no-knead” recipe that may come in handy, courtesy of the King Arthur Flour Co. website. Originally intended to make hamburger buns, I’ve found that it can be used for hot dog buns just as easily and with equally good results. Mix up a double batch of dough and make both kinds of buns; they’re well worth the effort. Since we’re on the subject of bread, I thought I’d share a second recipe similar to one that I found last year. It’s another recipe for no-knead bread, only this dough is used to make loaves and not buns. More importantly, you make enough dough for 3 to 4 loaves, baking one loaf at a time, as needed. The remaining dough is kept in the refrigerator where the longer it sits, the better it tastes. Unfortunately, I copied the recipe, pictures and all, but not the name of the website that supplied it. 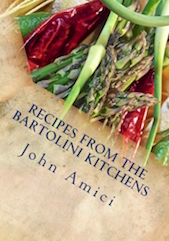 Within the portion I copied, however, the website’s author did make mention of his/her source, the book “Artisan Bread in Five Minutes” by Jeff Hertzberg and Zoë François. As luck would have it, there’s a recipe for no-knead bread on the King Arthur website and it, too, credits the Hertzberg/François book. So, since I cannot properly credit my source, I’ll send you to King Arthur for their version. I’ve used both recipes with equally good results. Coming soon: the giardiniera pictured above! 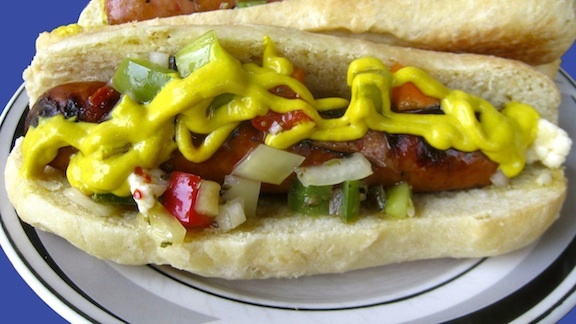 This recipe will yield 6 hamburger buns or, with a little shaping, you can get 6 brat or 8 hot dog buns. Although they’ll keep for a couple of days in a sealed bag, they are best when used the day they’re baked. This recipe will yield 3 – 4 loaves, depending upon their size. You mix up a batch of dough and, after its first rise, store it in the fridge. Later, when you want to bake some bread, you literally grab a handful of dough, shape it, let it rise for an hour, and bake it. 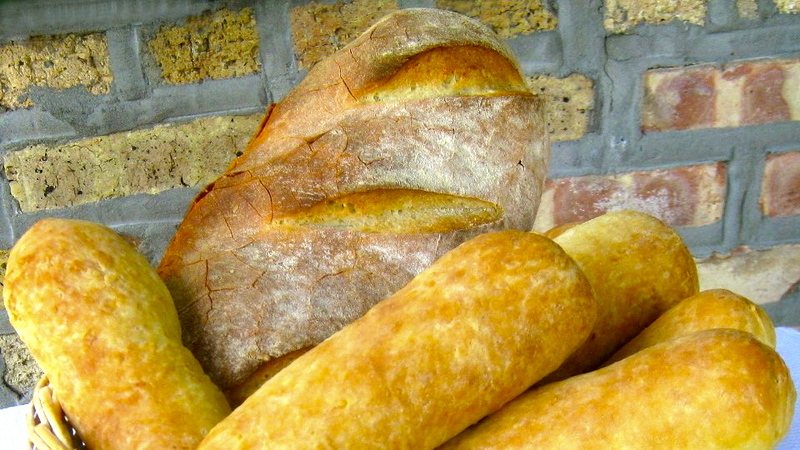 Make a batch of dough on the weekend and you can have freshly baked bread throughout the following week. It really is that simple. Before anyone questions my sanity for baking bread in the middle of Summer, I sometimes have sleepless nights due to insomnia. If that’s the case, like now, I take some of the refrigerated dough out, let it rise for an hour, and bake it. I’ll have a fresh loaf of bread cooling and it won’t even be 7:00 am. If you’re interested, the Hertzberg/François book may be purchased here. If you wish to visit its companion blog, click here. When I was a boy, Mom occasionally treated us all to home-made pizza. She’d make standard pepperoni or sausage pizzas for us kids but Dad’s was a special order. His pizza was called spianata and, unlike our kiddie versions, his was topped with only garlic, onion, rosemary, salt and pepper, resembling a rather plain focaccia. Yet, for so few ingredients, it made a very tasty pizza back then, while Zia and I use it today as a perfect accompaniment for any number of dishes. The recipe I’m about to share starts with what is called a “sponge.” Fairly common to many Italian/European breads, it’s a mixture of water, yeast, and flour that’s allowed to rise overnight. The mixture, in a sense, ferments and the resultant bread is more flavorful, almost sourdough-like. (In fact, I often add some of my sourdough starter to the sponge instead of yeast.) Of course, you needn’t start with a sponge but the spianata is so much more flavorful if you do. Once the sponge has “spent the night,” the rest of the recipe is pretty straight-forward and you should have no trouble following it. Proof the yeast in warm water, add to the flour to make the sponge, mix well, cover, and set aside. The sponge should be allowed to rise for at least 8 hours but no more than 20. 12 to 16 hours is usually best, in my experience. When you are ready to proceed, the sponge’s surface should be mottled with bubbles and it should have a strong yeast scent. To the sponge, add the flour, 1/4 cup olive oil, and salt. Knead dough for 5 minutes. Dough should not be sticky. If it is, sprinkle with flour and continue kneading until absorbed. Punch the dough down, turn it onto a floured work surface, cover with a towel, and let rest for 15 minutes. Meanwhile, coat a 9″ x 12″ sheet pan with the remaining 1/4 cup of olive oil. After resting 15 minutes, place dough onto the pan and use your fingers to begin stretching it to fit the pan. When it covers about 2/3 of the pan, flip the dough over and continue stretching the dough until the entire pan is covered and there’s enough dough to create a ridge around the pan’s edge. Cover with a towel and let rise until doubled again, about 1 hour. Pre-heat oven to 425*. Place garlic and onion into a small bowl and moisten lightly with olive oil. Once doubled, remove towel and, with your fingers, poke the surface of the dough repeatedly. Sprinkle surface with garlic, onion, rosemary, coarse salt & pepper. Bake on oven’s center rack for about 25 minutes. The spianata should be lightly browned. 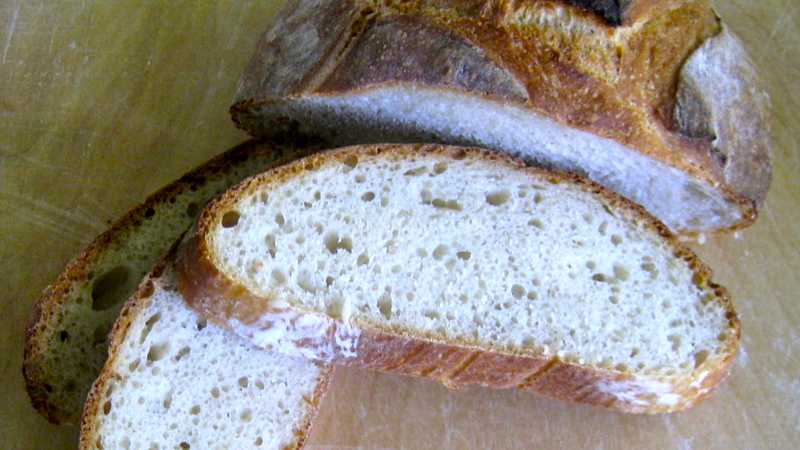 Like most breads, spianata can be frozen easily. Once it is fully cooled, wrap it tightly in aluminum foil and place in your freezer. When you are ready to serve it, place it, still wrapped in foil, in a pre-heated 350* oven for about 25 minutes. Enjoy! Located in the north of Italy, Emilia-Romagna is a collection of provinces, the southern border of which is shared with San Marino and Le Marche. Dad emigrated from San Marino, Mom’s family from Le Marche. 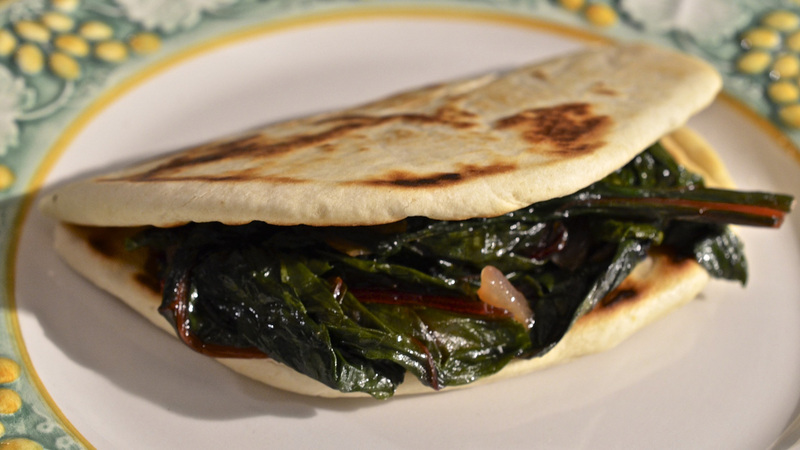 Pieda, today’s recipe, originated in Romagna but it came to our dinner table via San Marino. 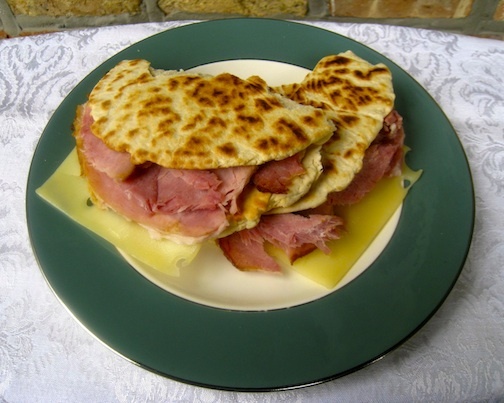 It is a simple flatbread, similar to pita or tortillas, and, when folded in half, can be filled with lunch meat, cheese, or a variety of greens. My family’s favorite was Swiss chard that had been blanched before being sautéed with a little sliced onion in garlic-flavored extra virgin olive oil . (See Mom’s way of cooking Vegetables.) No matter how you choose to fill them, pieda are best when served immediately after cooking. Place all ingredients in food processor and mix until a ball of dough forms. Cover with plastic wrap and refrigerate for 30 minutes. Remove a small amount of dough and, using a rolling-pin, roll it out until it is about 6 inches in diameter and no less than 1/8 inch thick. Cook in a hot, non-stick frying pan over medium-high heat. It should only take a few minutes per side. Use a fork to prick any bubbles that may form during cooking. A side is done when it is mottled with brown spots of varying sizes. Place cooked pieda on a warmed dish in a warm oven until all are finished. Serve immediately.